This lovely 2003 VAUXHALL MOVANO CAMPER VAN is based upon a 2187cc Turbo Diesel with only 101.019 miles Covered. This Camper with turn your weekends into an adventure! With a forward lounge that quickly makes up to a bed this lovely Motor-home is a very pleasant place to spend your holidays and weekends away. Lots of storage can be found. 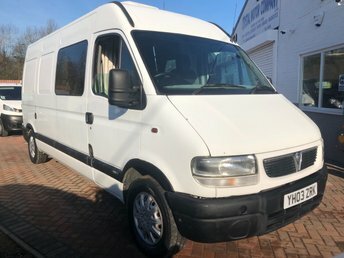 The Van comes with Reversing Camera, Spare Key, double seats converted into a double bed with two side windows, curtains, build-in Microwave, Build-in Fridge, Build-in Cabinets, Build-in Sink, twin Gas Hob, with Large Wine Fridge, Lots of Cupboards and Storage, Air Conditioning Unit Fitted, TV Fitted( Only Plays DVDs ), Rear Storage Fitted, Build-in Guardian 5000 Watts Generators, All Electric Cables Supplied for Generator, LED Lights, CD Player, Fully Carpeted with Night-Lights. Any more Questions please Ask.All our quality used vehicles come with a valid MOT & full service as required prior to collection, all are checked over thoroughly. Businesses requirements vary considerably, which is why Vauxhall has designed a line-up of commercial vehicles that takes the needs of all firms into account. Companies interested in a compact van that's perfect for small deliveries and moving stock need look no further than the Vauxhall Corsavan, while the manufacturer's Movano range is focused on businesses that require a lots of space, a large payload limit and complete versatility. You can browse the full range of used Vauxhall vans for sale in Northampton here on our website, before contacting a member of the showroom team to arrange a test drive in the model of your choice. Here at Crystal Motor Company Limited we're proud to be able to offer a wide choice of quality used vans, with options to suit every budget.